Discover a real alternative to classic digitalization! Less bulky (basic table) and faster, this system allows you to digitize one or more patterns at the same time and in one click. In addition, you can generate your files in various CAD formats (Lectra, Gerber, Vetigraph, DXF AAMA or others). Determine your material use in a few seconds for the calculation of the cost price! 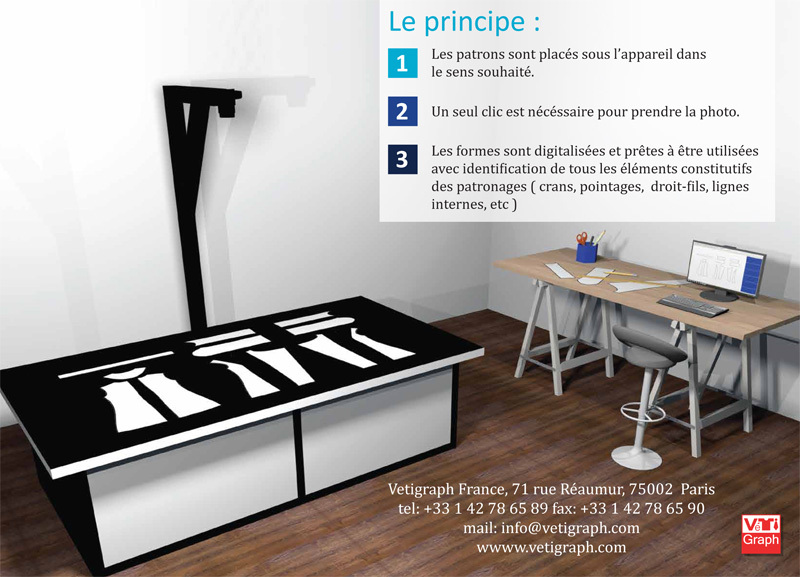 After digitizing the basic size with the Scangraph® solution, compared to a table of measurements, the system simulates the gradation and automatically performs a cutting placement with a given size distribution. The margin of error of the material use is less than 4% compared to the production.